6 Key Keypad, vintage. Manufactured by Grayhill. Here is a vintage old bell type keypad with 6 keys. Normally open contacts, 3 pins per key. 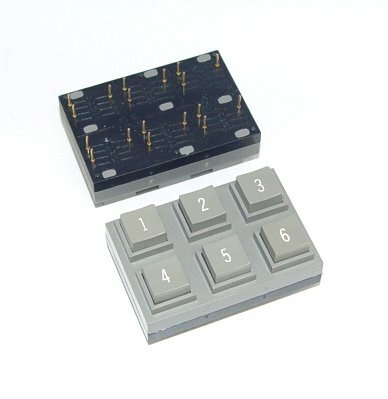 Functions like a normally open switch with an additional pole. 2.06" x 1.37" x 0.75" (depth without pins). There is a patent # of 3,818,169 on this keypad, for the curious here is the patent in PDF format.